First Line: "When I have a little money I buy books." This is a gorgeous book that all book lovers will want to get their hands on. With a royal purple ribbon to use as a bookmark, Books Make a Home is divided into chapters showcasing books in every room in the house: as decoration, in kitchens and dining rooms, in bedrooms and bathrooms, in children's rooms, and-- my personal favorites-- on stairs and in corridors, in living rooms, and in libraries and studies. As you can see by my favorites, I'm a bit of a traditionalist when it comes to storing and displaying all my books (although I don't have stairs or even a hallway wide enough in which to put them). As you can imagine, the photos are glorious and will have readers torn between running to the nearest bookstore or revamping their own libraries, but there is more to this volume than the photos. The text itself is well-written and informative, and a large section in the back lists resources and suppliers that will lead to many an internet search. Books Make a Home is the perfect book to encourage daydreaming and wish lists, or to motivate bibliophiles to do some reorganization, and it definitely would make a wonderful gift for anyone-- like me-- who's completely under the spell of the printed word. This sounds lovely. I love the title! This book IS lovely, Kathy! Sounds absolutely terrific, Cathy! Thanks. 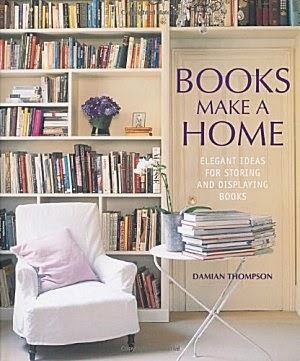 I could use some new storage/display ideas...looks like this book might provide them! I want this book -- and a craftsperson to do the work to add book spaces to my apartment. I love to see these unique arrangements for book storage. I have an apartment with a hume floor to ceiling bookcase and floor to almost ceiling. However, I also have books everywhere, stacks in the foyer on the table, some in the kitchen, stacks in the bedroom. Perhaps not bad form, but certainly a stumble fingers moment waiting to happen!